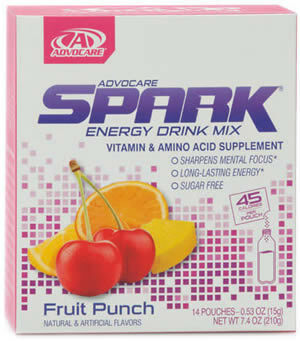 Advocare Spark Energy Drink comes in sachets or pouches of powder. The powder should be blended or stirred into 1 cup (8 fluid ounces) of water. All flavors of Spark have the same amount of caffeine per serving. The powder is available either in individual packets or a large tub. It is sweetened with Sucralose (Splenda) although does contain 45 calories per serving. 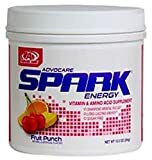 Advocare Spark contains GABA, which is an ingredients that most other energy drinks do not include. Advocare once made a product called "Kickstart Spark" that was controversially targeted towards children aged 4 and upwards. Kickstart Spark contained 60mg of caffeine per 8 oz serving. For more info about Spark, see our review here. Advocare also makes a ready to drink Energy Shot called Slam. It has the same caffeine content but in a much more concentrated dose. How Does Spark Energy Drink Compare? Spark Energy Drink contains 15.00 mgs of caffeine per fluid ounce (50.72mg/100 ml).